In our earlier post, we announced the availability of HST public data for currently active instruments in the AWS Public Dataset Program. In that post we described how to access ~110TB of data (raw and calibrated) from ACS, WFC3, STIS, and COS available in the stpubdata S3 bucket. 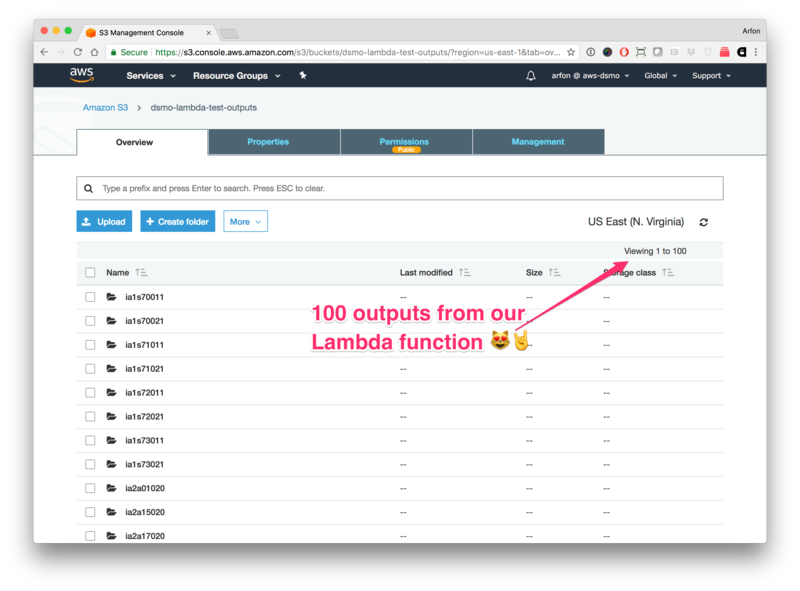 In this post we will show how to leverage an AWS cloud service called Lambda to process a set of WFC3/IR data. Using this approach it is possible to process every WFC3/IR image (all ~120,000 of them) on AWS Lambda in about 2 minutes (and for about $2). Lambda1 is a serverless2, cloud-hosted function that can be called on-demand. The basic idea is that a function (some code written by you) can be saved somewhere and used when needed. When the function is not executing there is no cost, but when it is, you just pay for the CPU and memory that are used for the duration of the function executing. This means that services like Lambda are charged in weird units like GBms (Gigabyte milliseconds) which is a combination of the memory used by the function and how long it executes for. 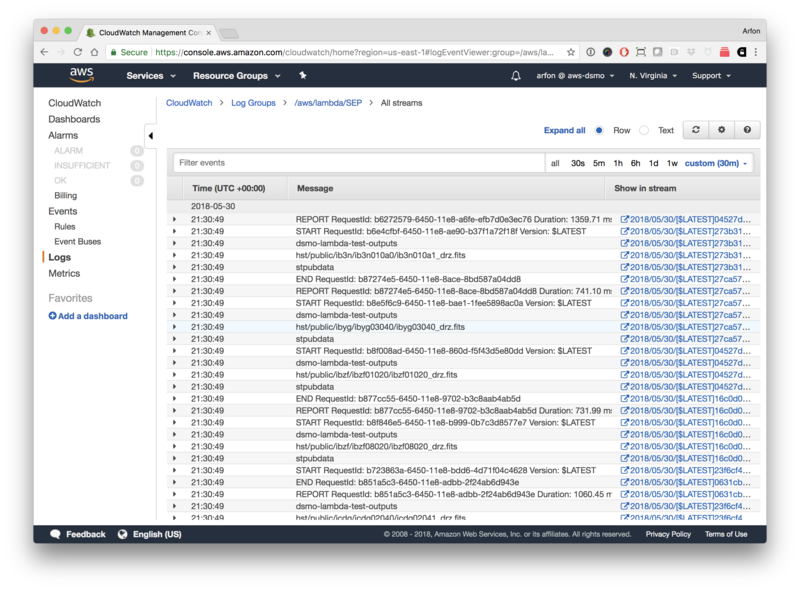 In this post we are going to be using AWS Lambda together with the HST public data on S3 to demonstrate how serverless computing can be used to process data at scale (and very low cost). In what follows, we are going to assume you already have an AWS account, have AWS secret access keys and are able to create an authenticated session using the boto3 Python package with these keys. The example above can be run locally and all you need installed are Docker, the Python AWS client boto3 library and the latest version of the astroquery library (install from the master or build from source to get the necessary features). 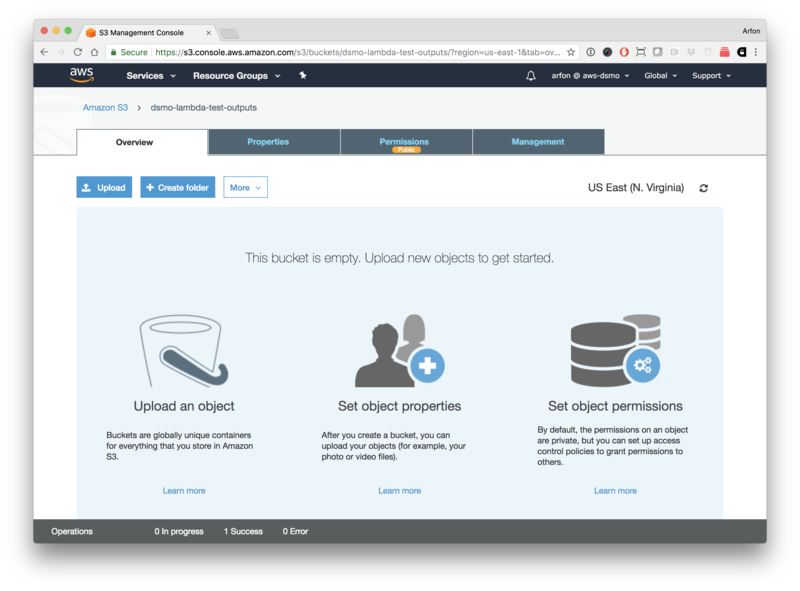 You can use an AWS EC2 instance to work through the example but that is not required beacuse we will not be downloading any of the data. If you want to try something simpler than this example, take a look at our earlier blog post introducing the AWS Hubble public dataset. The first thing we need to do, is write a Lambda function and build the computational environment (e.g. any software dependencies) required to support the function. Because Lambda functions spawn in milliseconds, Lambda requires all of our dependencies (Astropy, numpy etc.) to be installed and available as soon as the function is triggered. Lambda does not allow you to specify the machine environment that supports the execution of your function (the underlying machine running a Lambda function is AWS Linux) so you need to compile all of your dependencies and zip them up as part of the Lambda function. Open the S3 console and create a new bucket to hold your function. Upload the venv.zip file to the bucket. To change what the Lambda function actually does, modify process.py which is the code that is called when our Lambda function executes. If you change the function dependencies, modify the file requirements.txtto reflect the requirements of your function. In this worked example, we are going to use the SEP library3 (which makes the core parts the Source Extractor available as a standalone library) to find sources in a collection of WFC3/IR images. Note: If you would rather begin with a more straightforward example, we have also written a small Lambda function that downloads a FITS file from a location on S3 and summarizes the content of the opened FITS file using the astropy.io.fits info() function. This code and the one below can be run either as a Python script or from a Jupyter notebook. Make sure you follow the inline comments above for creating a ~/.aws/credentials file and a Lambda role, and change the name of the S3 bucket to the one you created in the previous step. Make yourself an empty S3 bucket too. To run this piece of code (again, either as a Python script or in a notebook) add your own credentials at the top and the name of your empty output bucket as s3_output_bucket. Because we are triggering Lambda in an asynchronous4 mode (by passing InvocationType='Event'), the API calls to Lambda to process the 100 files we have queried from MAST fire extremely quickly (~1 second total). Sources detected by SEP. Not too shabby! While we could extend our Lambda function further, at this point we have some code that does something reasonably substantial with a WFC3/IR image. Let’s look at how long these functions took to execute, and how much it cost. When a Lambda function executes, the outputs (e.g. any print statements in your script, as well as a high-level summary of the Lambda execution) are outputted to a service called Cloudwatch. Cloudwatch logs for our SEP function. Looking at the above report for one of the Lambda function executions, our SEP source-extraction function (for one of the WFC3/IR images) took ~1.1s to download the image, run SEP, and write the FITS catalog back out to S3. Earlier in the post, I mentioned that Lambda is priced in GBms. While we only used 164MB of RAM with this function, we requested 1024MB (1GB) of memory and so we are charged for how much we asked for6. So for less than $0.01 ($0.0018337) we have extracted sources for 100 WFC3/IR images. Extrapolating these numbers to every WFC3/IR image ever taken (122,078 at the time of writing) works out at about $2.24 in Lambda charges. With our example of processing 122,078 files we used something like 134,000 GB-seconds. i.e., it was completely free. If you want to get a feel for how much Lambda costs, take a look at this simple cost calculator from dashbird. We have not included the cost of storing the results (FITS tables) on S3. This is likely about $0.11 cents/month for ~10GB of output data. We are assuming that you are running the script to invoke Lambda on a machine you own (i.e. you are not running a separate machine on AWS). Important: This costing assumes that you are running the Lambda function in US-East Region which is in the same AWS Region as the data in S3. In this mode of operation, there are no charges for downloading the data from S3 to your Lambda environment. 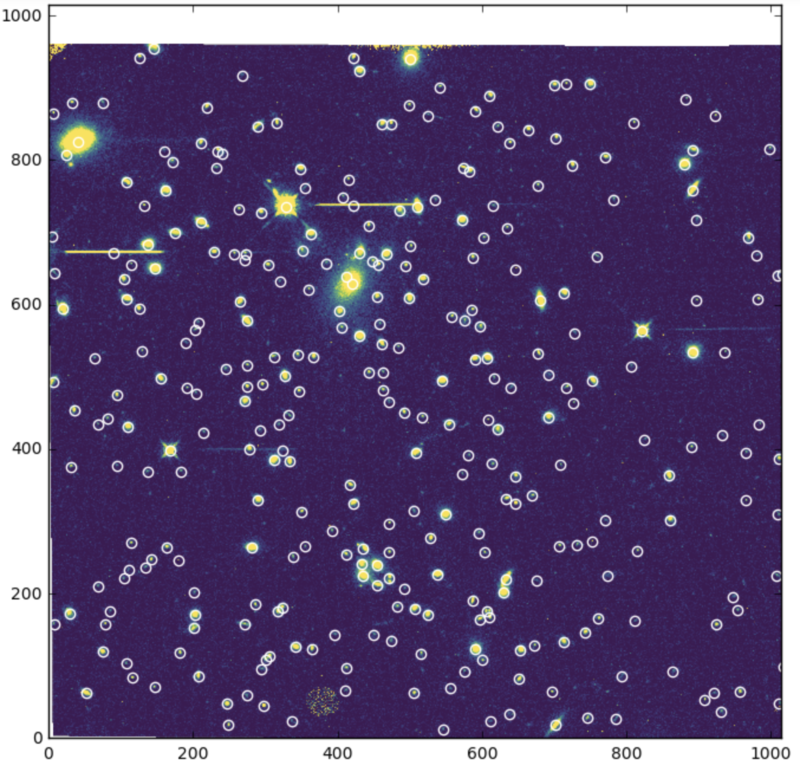 In the cost calculation above, we have calculated what the theoretical cost of processing all of the WFC3/IR images. How long might this actually take if we were to try it? That’s right, it would likely take just over two minutes to process every WFC3/IR image ever taken using Lambda7 ⚡️⚡️⚡️. Services such as Lambda (a.k.a. serverless computing) offer a powerful new model for on-demand computing, especially when combined with cloud-hosted astronomical datasets. We would love to hear about your experiences of using AWS Lambda for astronomical data processing. 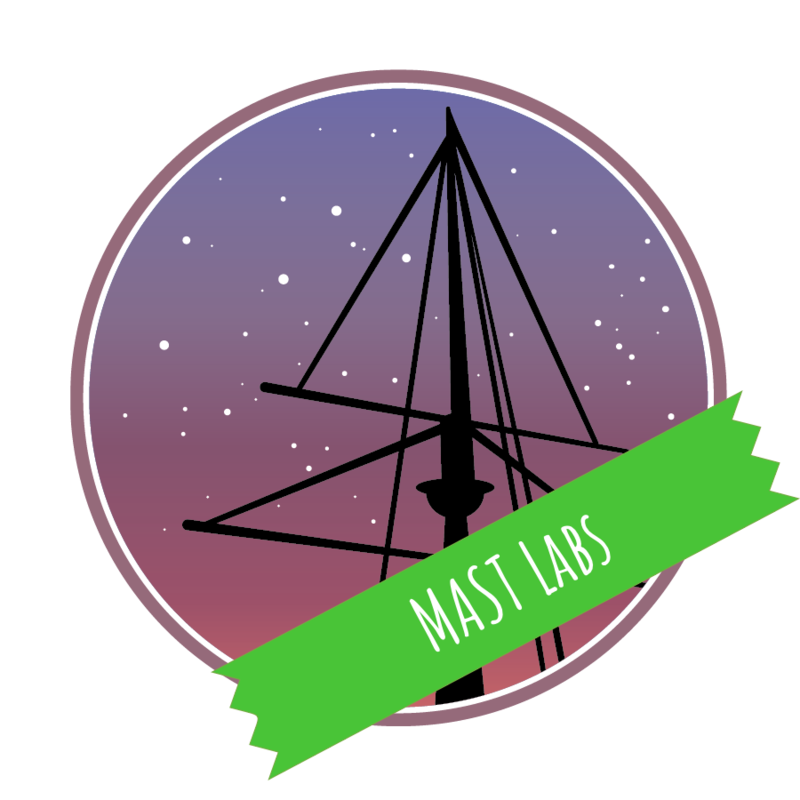 You can find us on Twitter (@mast_news) or email us on dsmo@stsci.edu. Finally, as a reminder, if you are interested in doing more with the HST public dataset on AWS then you might want to take a look at the Cycle 26 Call for Proposals which includes a new type of proposal: Legacy Archival Cloud Computation Studies. This proposal category is specifically aimed at teams that would like to leverage this dataset.